Baby and I have been growing fast these days. Matt and I spent Easter weekend on a mini-babymoon in NYC visiting my sister and his brother, both of whom live in the area. We had originally planned a longer babymoon to NYC and the Dominican Republic, but then an outbreak of viral disease happened, so we shortened it. New York was a lovely time, though, with lots of walking and catching up. Apparently baby was going through a growth spurt, so those round ligaments were a little sore, but totally worth it for the fun walks and delicious foods. We went the the Easter Parade on 5th Ave, which is more like a huge block party, complete with excellent hats. And bubbles! 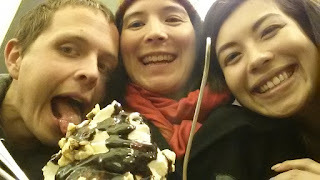 And we had ice cream, of course. We've started accumulating more baby things, including some loans from wonderful friends, hand-me-downs from kind relations, and buys from craigslist. It turns out the folks you meet buying baby stuff on craigslist are usually super nice and excited for you. Much better than the people you buy electronics from on craigslist. My ultimate team was so kind to throw us a baby shower last weekend, with block decorating as one of the primary activities. These folks took to the task with a gusto, so we have some awesome and nerdy blocks spanning the alphabet, numbers, and other themes. We are getting pretty excited about this baby thing.